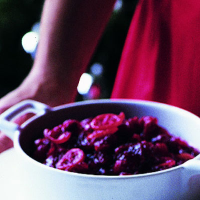 This rich, red cranberry sauce with port and kumquat is the perfect accompaniment to roast turkey. Place the fruit in a small pan with 150ml cold water and bring to the boil. Simmer gently for 10 minutes until the fruit softens. Add the sugar and port, and stir until the sugar dissolves. Simmer for 7-10 minutes until the sauce has thickened. Transfer to a small bowl and serve warm or cold. You can make the sauce up to a week in advance and then keep it in the fridge. Or store it in the freezer, in a freezer-proof container, for up to 3 months.